With the anniversary of the start of the First World War only months away, the war history of Avonmouth and Shirehampton has been a central topic of the All Our Stories throughout 2013. In particular we have been researching the Army Remount Depot at Barrow Hill which, over the four years of the war, saw over 300,000 horses and mules from America and Canada stabled and cared for before they moved on to the battlefields of France and Belgium. As a part of the project’s desire to recreate lost histories and to imagine past communities, we spent a day with the Year 6 pupils at Avonmouth Primary School; the school is especially interesting because it has been built on the site of the veterinary hospital that cared for sick animals at the Remount Depot. The day began with a walking around Shirehampton where Pete Insole showed us a number of places on the edge of the old village that we could imagine as part of the old army camp. We were told, for example, that Barrack Lane is not named after the WWI Remount Depot, but because it related to a nineteenth century gun emplacement near the river’s mouth. We then walked around the edges of the old clay pit which, during the war, were lined with the huts that the men lived in. Just around the corner, we looked at the inter-war housing then branded ‘Homes for Heroes’ that was built to help accommodate soldiers that had been in France fighting. In the afternoon the Shirehampton Primary School pupils took part in a cartography workshop where they created their own map of the Shirehampton Remount Depot. The map was later included in the programme of another All Our Stories event, a play, Their Lives Beneath Our Feet. The play was created by the Year 6 pupils with help from the Bristol Old Vic theatre and was based on their studies of the old army camp and was performed on 12 July 2013 in and around the site of the old depot. But what made the lost history of the Shirehampton Remount Depot come alive for the school children, both in creating their maps and the play, and in imagining war horse rather than houses covering Barrow Hill, were a series of letters from Charlie Day, a soldier who was stationed at the Depot in 1916. 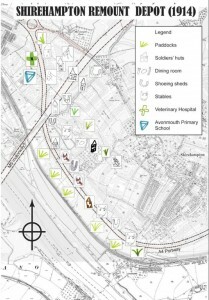 More details of Their Lives Beneath Our Feet and the work of Know Your Bristol All Our Stories and the Avonmouth Primary School’s activities can be found here.